FIBERDOS from m-tec is the flexible dosing system for the fully automatic incorporation of fibres in bulk material processes. It consists of an oval or rectangular silo container with specially designed screw discharge device and a dosing unit with rotating roller brushes under the silo base. FIBERDOS is perfect for dosing synthetic, cellulose and glass fibers between 100 µm and 8 mm. Naturally greater lengths can be tested. The whole system is based on negative weight on load cells. The system weigh controller attached to the FIBERDOS starts the dosing process by means of a specified process. The motors of the specially designed screws are set in motion by the frequency controlled weigh unit and convey the fibers to the center of the container. Two pneumatic slide valves open in the middle of the discharge floor. They expose a rectangular cross-section through which the fibers reach two rotating roller brushes, which dose and deagglomerate the fibrous material to the next process. Before the set weight to be dosed is reached, the automatic change in the dosing parameters creates a fine stream of material. This process enables the fibers to be accurately dosed. The dosed mass is controlled by the measuring cells and the supplied measuring logic. Thus the FIBERDOS is operated as a so-called net or loss-in weight scale. In principle, the FIBERDOS can be installed variably, however, because of the cost and process speed, it is best to place it directly on the mixer or large component scale. Another option is to incorporate it as an additional module in the m-tec small component dosing system. In order to gain specific information about actual achievable performance when using a specific fiber, it is possible to carry out dosing tests with the mobile m-tec pilot plant station. The minimum dosing volume for the system is approx. 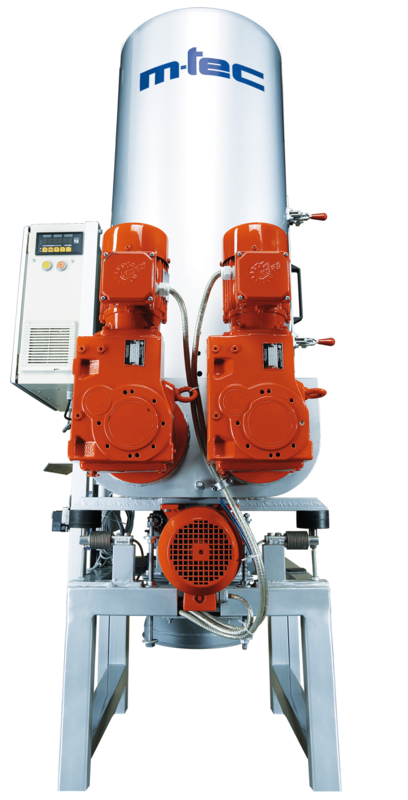 100 g. The maximum dosing volume is defined by the volume of fiber in the silo hopper. Both values depend on the specific properties of the fibers. Depending on the fiber, fiber type and setup conditions, a dosing precision of up to +/- 20 g can be achieved. Several standard installation sizes are available!